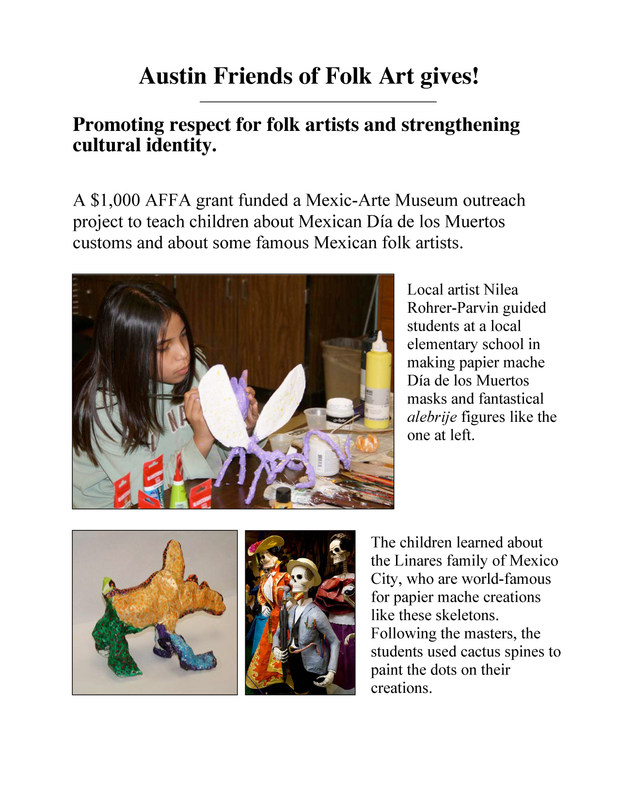 Grants to artists, educators and institutions are one way AFFA promotes folk art. 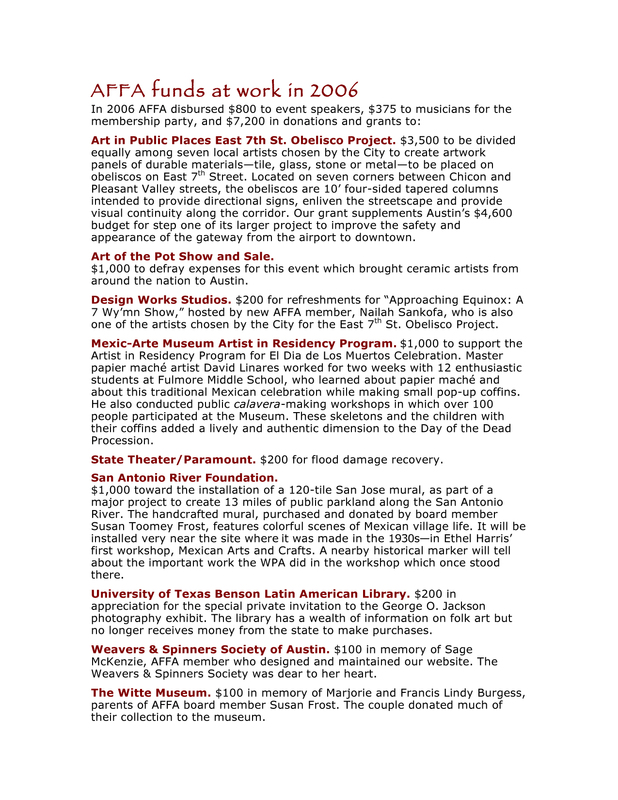 Just look at what Austin Friends of Folk Art funds have helped make happen! 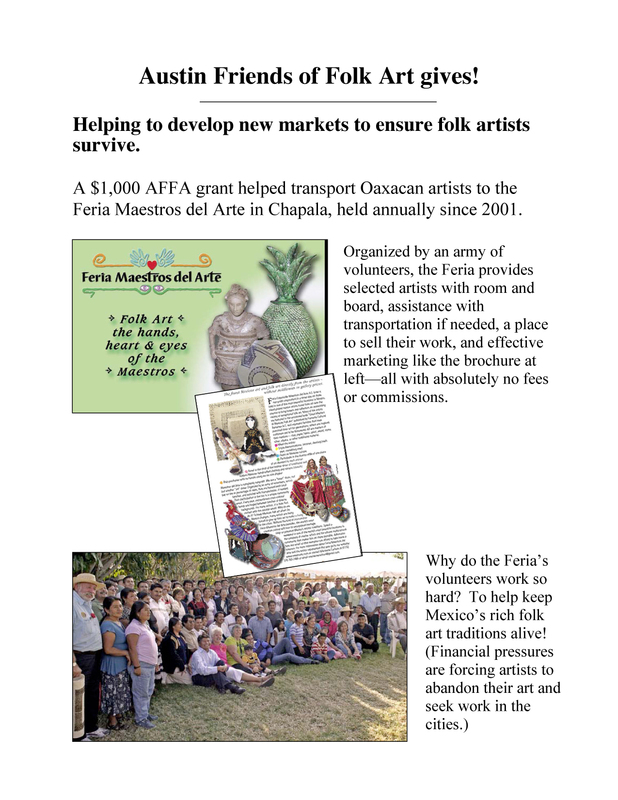 La Feria Exposición Maestros del Arte received $1,000, which will be used to support a 3-day art show that brings Master folk and indigenous artists, as well as up-and-coming artists who work in Mexican traditional arts, from all corners of Mexico to Lake Chapala, Jalisco. 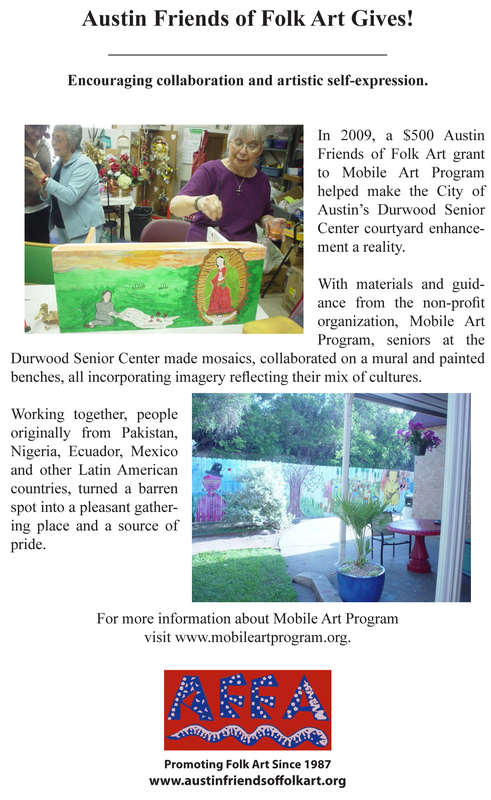 This all volunteer group’s central goal is to provide a stable market for traditional arts and artisans so that they will not have to abandon their heritage to relocate and take up work in the cities. 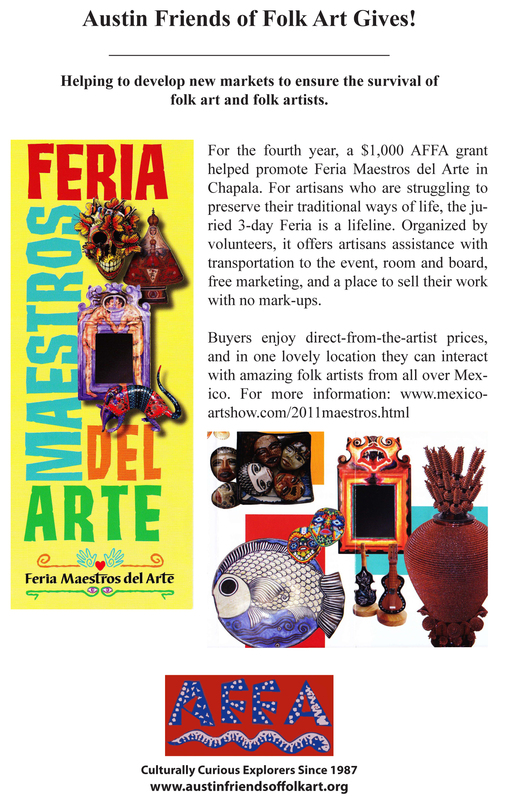 For many artists, the Feria is their largest income-making event for the entire year. 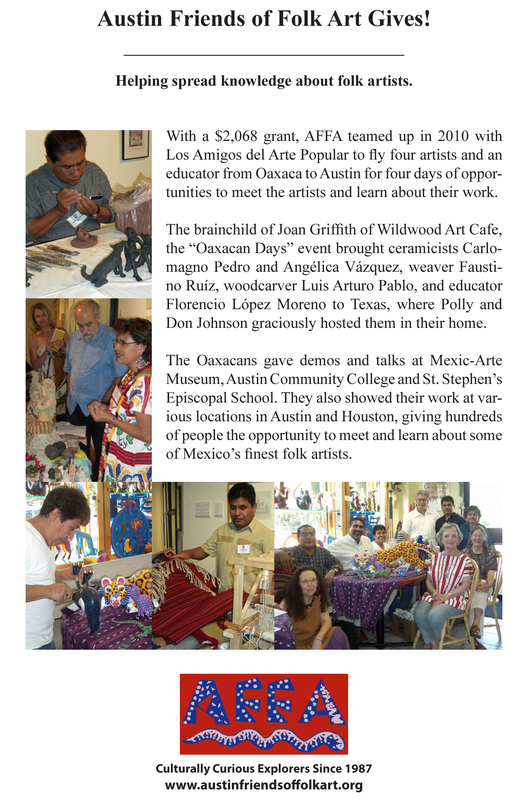 Spencer & Rains Art and Music received a grant of $600 to develop a presentation of folk art and folk music for November 21 – Dec 28, 2014. In these performances of early Texas folk fiddle styles, Howard Rains and wife Tricia Spencer will be surrounded during their performances by Howard Rains’ paintings of traditional fiddlers, thus uniting folk art and folk music. Spencer & Rains have traveled and collected not only music, but many stories, and their project is designed to engage and bring the art and music to a wider audience. 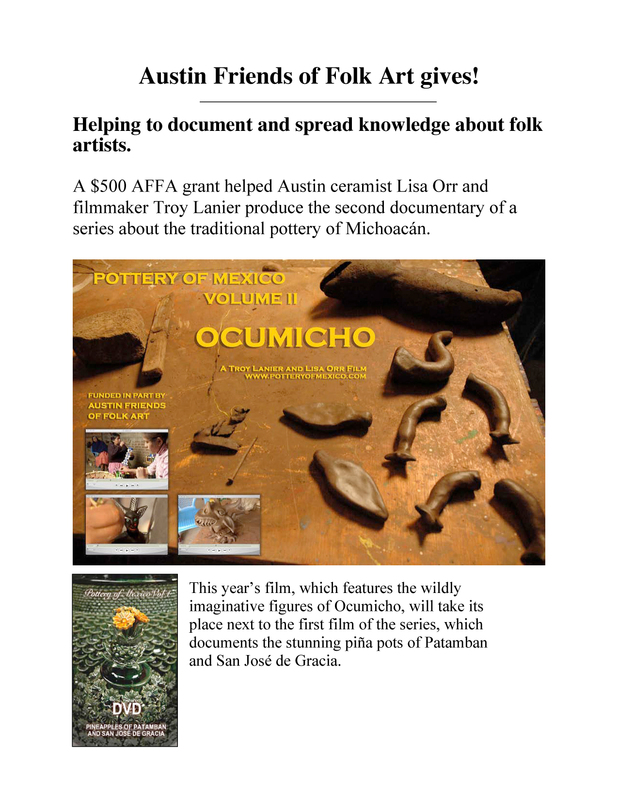 Lisa Orr and Troy Lanier were awarded a grant for their DVD project, Pottery of Mexico Vol III: The Fantastical Figures of Ocumicho. 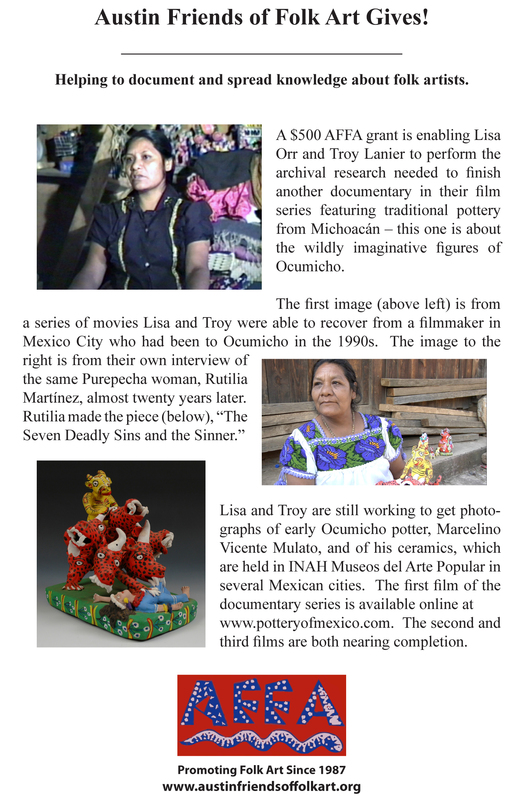 This third film in the Austin-produced DVD series on ceramics in Mexico focuses on the pottery of Ocumicho. 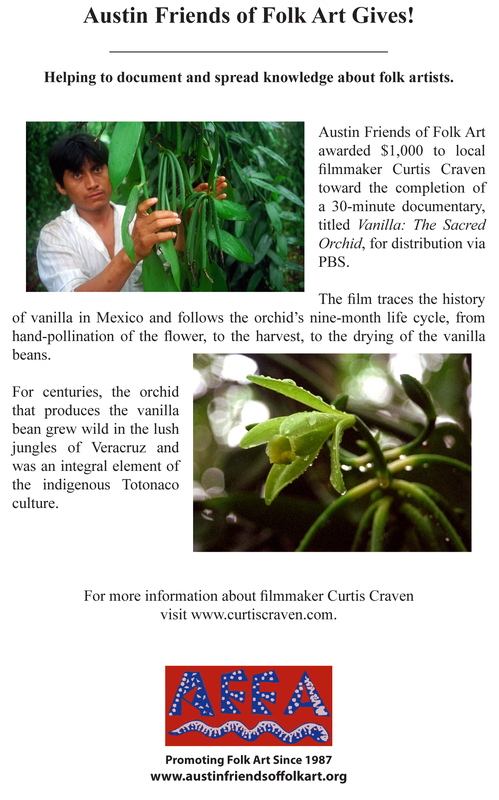 Film editing was completed in May 2013, but the film still needs original music to be performed and recorded by Purhépecha musicians in time for the expected completion date of fall 2014. 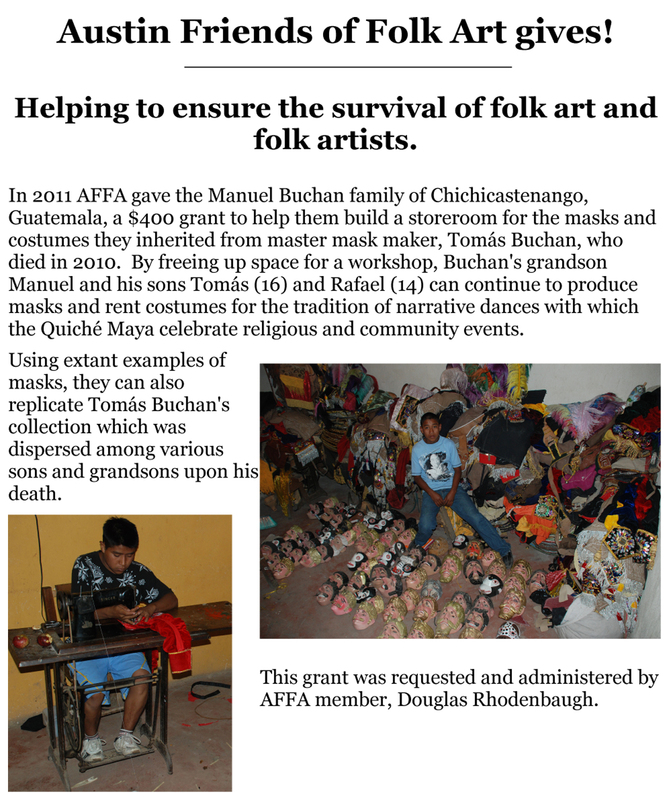 The $500 funding from AFFA will be used to make a one-time payment to the musicians for a recording of their work and for all rights to use their music as the filmmakers choose and for any size audience. 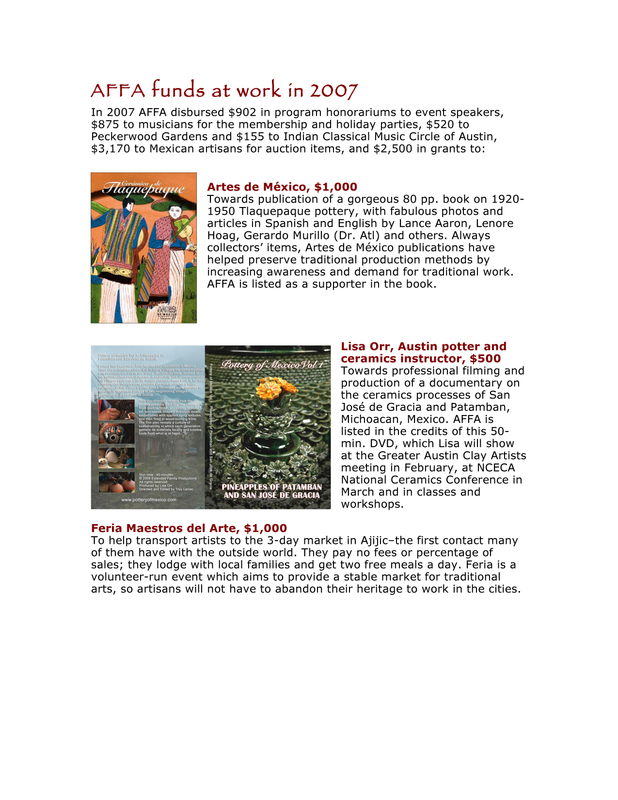 Carol Hayman received a $500 AFFA grant to help fund a documentary involving interviewing, filming, and taking photographs of crafts people in Ayacucho, Peru, a center of one of the Peruvian regional crafts styles. 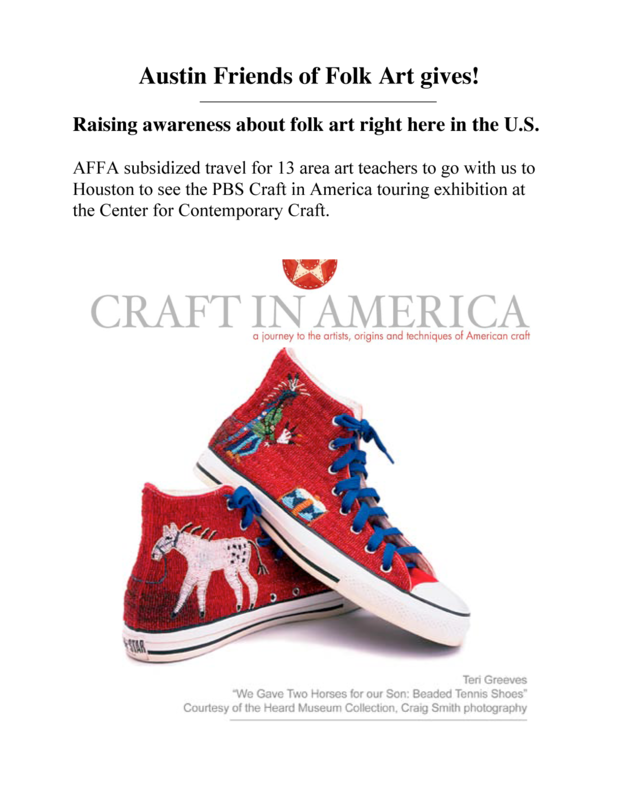 The traditional products in Ayacucho include textiles, ceramics, tin ware, stone carving, instrument making, leather work, jewelry, and retablos in endless variations. Currently, Carol is in the process of turning the video footage made last year into short videos to give to the artisans on CDs and to post on You Tube. The grant will pay an assistant to help edit the video footage. This involves translating the interviews and adding captions and music. 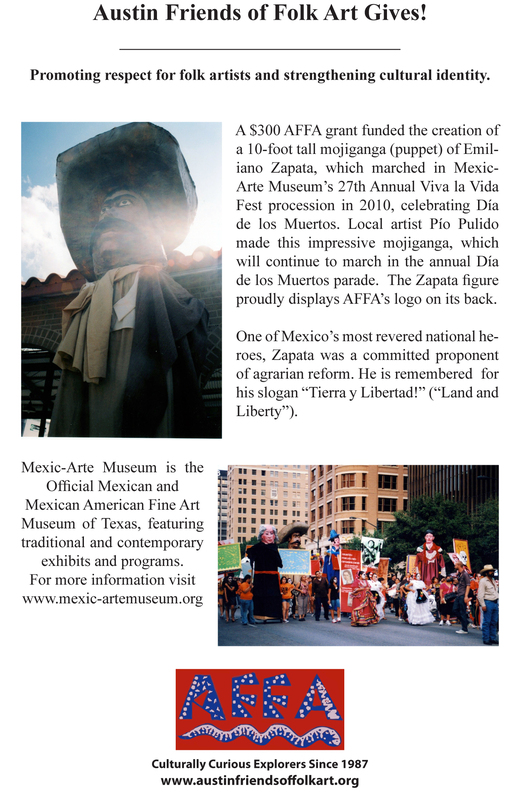 Mexic-Arte Museum’s funding of $500 is to bring world-renowned artist Dennis McNett to Austin for the 31st Annual Viva La Vida Festival October 11–18, 2014. 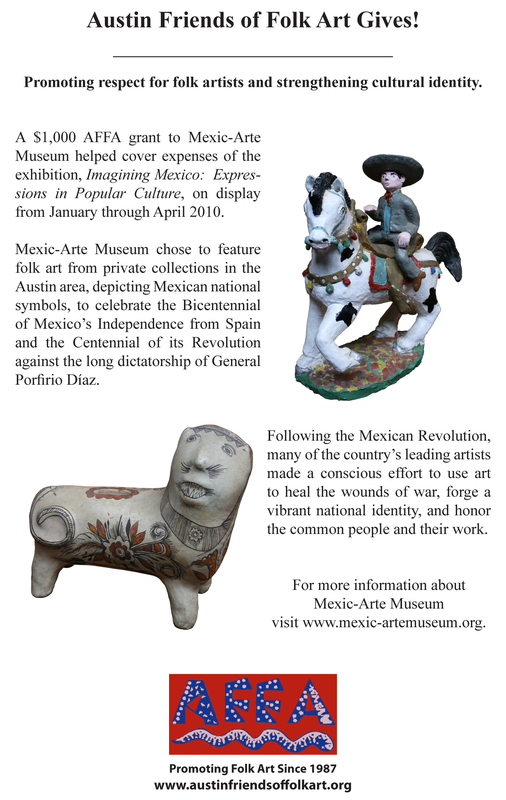 Using sculpture, linocut, leather etchings, papier-mâché and relief printing, Dennis will create his “animalistic storytelling journey” inspired by Día de los Muertos imagery as well as Latin American and Mexican mythology. 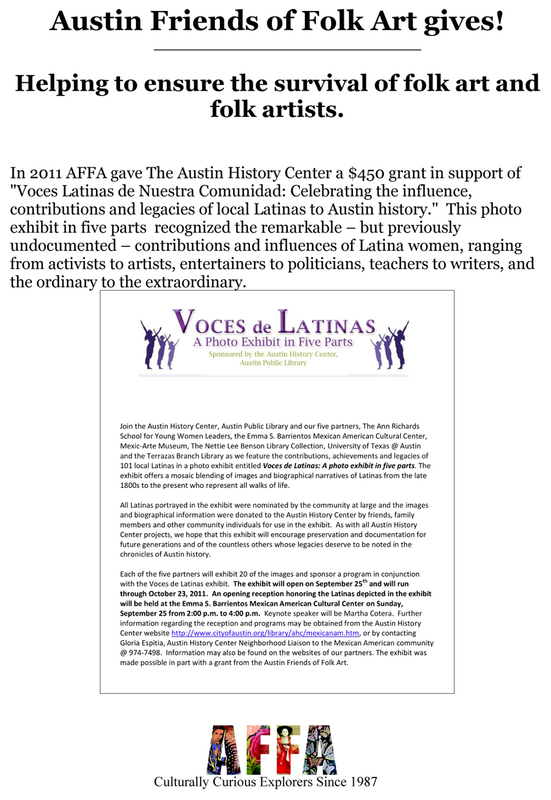 The $500 grant to Puerto Rican Folkloric Dance will assist Afro-Puerto Rican folklore traditions by bringing to Central Texas a unique festival that cannot otherwise be experienced in this region. 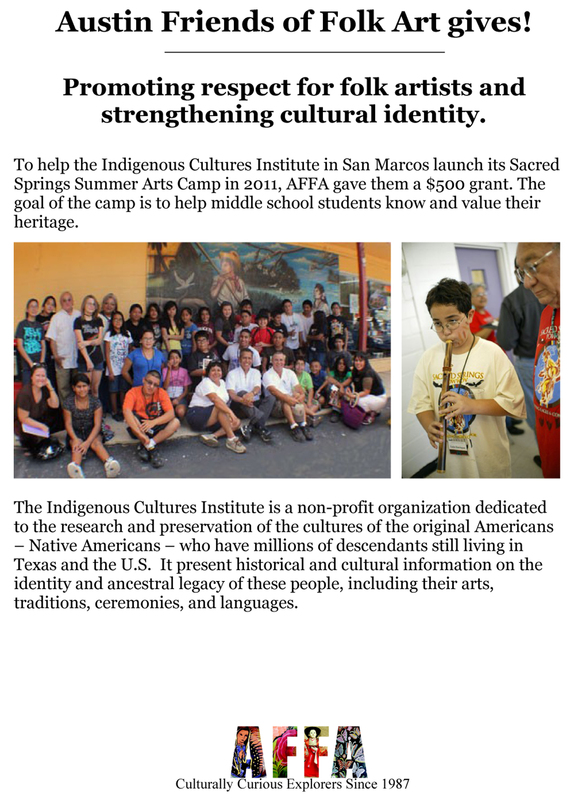 This project is bringing Bomba to Austin in its truest form, as a living folkloric tradition. The week of June 18 – 23, 2014, will culminate in a heritage festival, featuring Jorge Emmanuelli Náter and his performing group. The festival will include a large Bombazo that will give many people the opportunity to experience Bomba dancing and singing. 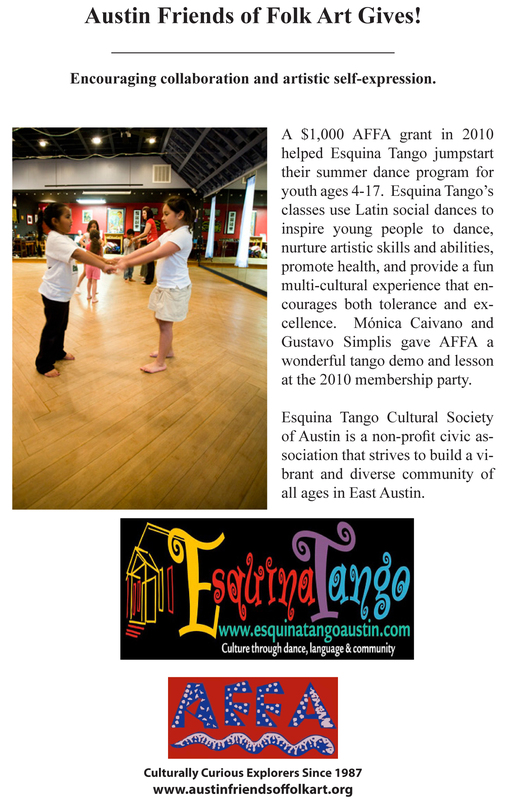 The heritage festival will also feature the hottest salsa in Central Texas music by Orquesta Trabuko, displays by handicraft artisans, and authentic Puerto Rican food. 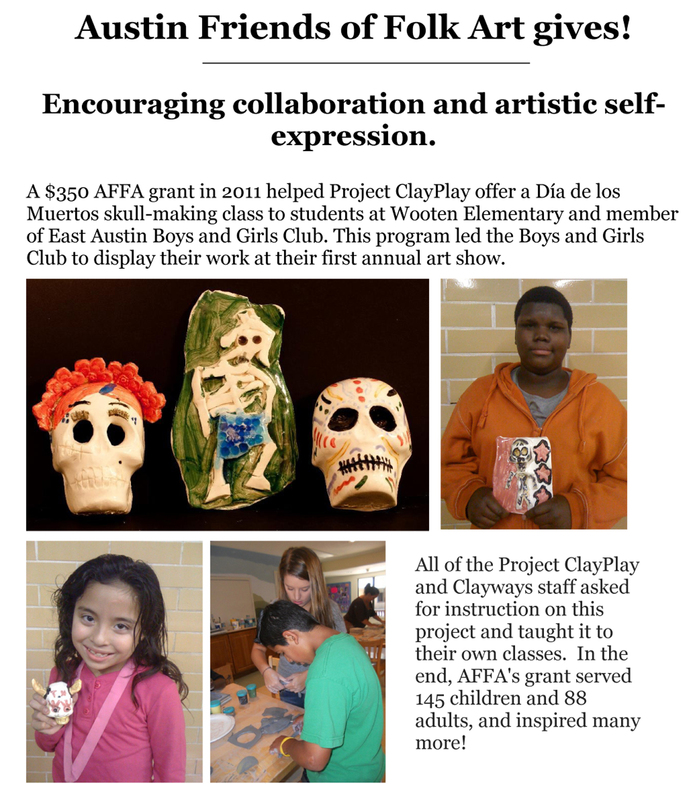 Austin Discovery School received a grant of $400 for the school’s Día de los Muertos Celebration. 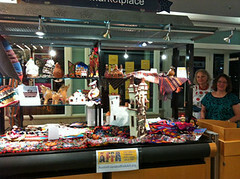 This event honors the traditional folk holiday celebrating life and death and publicly showcases folk art. For the celebration, symbols line a long altar created with paintings, offerings, and pictures. On the day of the event students and families are dressed as skeletons, including painted faces. After the procession, traditional Latin American music is played.